How to make Mexican orange granita - Easy and fun recipe! Refreshing, suprisingly more-ish, and easy on the eye, Granita is also pretty easy to make. We chose to make Mexican orange granita for our Day of the Dead party, served in frozen orange ‘bowls’ for added wow factor, but the sky is the limit when it comes to flavors. How about Mango, raspberry (although it would be a little tricky to serve in it’s skin…) or lemon and mint? And for those who drink a bit of alcohol, how about a slug of liquor on top? How to make orange granita! Granita would also make a fun and healthy alternative to ice cream at a kids party. It really comes into its own on a baking hot summers day. This recipe can served as a drink(slush puppy style) or as a desert! Mix the sugar and the water in a small saucepan and simmer over low heat until the sugar has dissolved and the mixture is clear. Pour in your fruit juice and simmer gently for a further 5 minutes over medium heat. Remove from the heat and allow to cool. Sieve the mixture into a shallow metal dish or tupperware box and place it in the freezer. Freeze for an hour or two, until, it isbeginning to go hard, then take the container from the freezer and scrape with a fork, working from the outside in. Repeat every hour or so, at least three times, until the granita forms into a granular, snow like consistency. Serve the granita in frozen half orange shells as shown, or in chilled cocktail glasses or bowls, garnishing with a fresh mint leaf. Wash the oranges and cut in half, also slicing off the very bottom of the fruit so that your orange bowls won’t tip up. Using a sharp knife, carefully remove the orange flesh, being careful not to cut through the bottom. 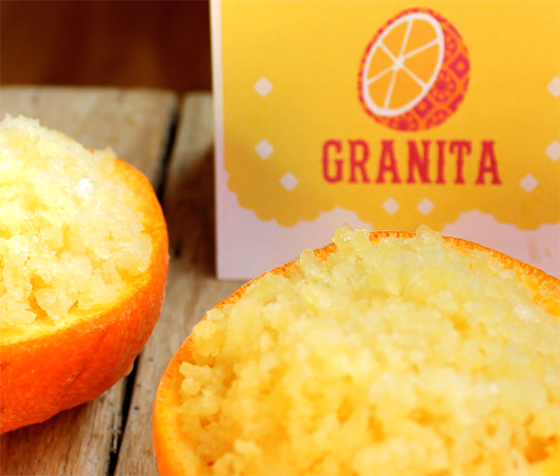 Stand the oranges on a plate and.pop in the freezer until you are ready to serve your granita. 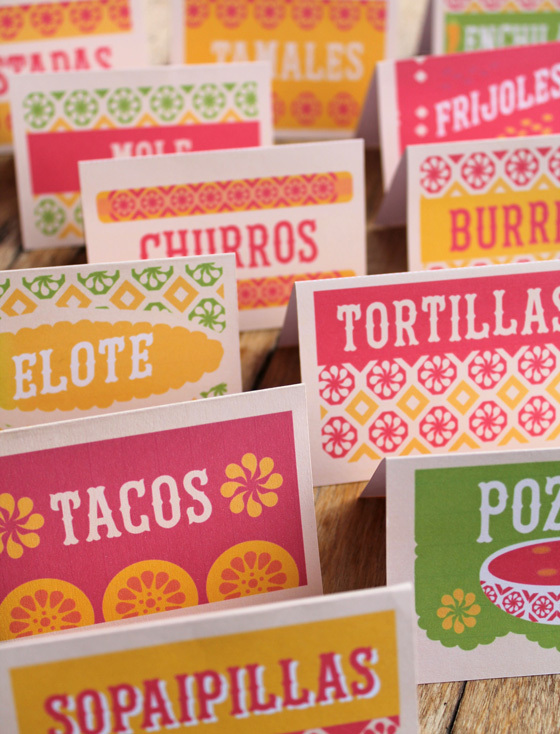 There are 99 signs in the pack, featuring popular Mexican dishes and drinks, along with some blank cards to fill with your own favourite recipes! 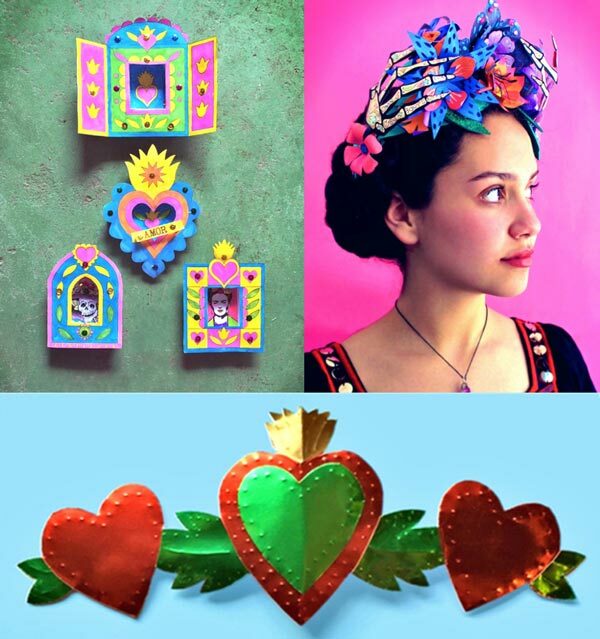 Check out this cool tutorial on making a paper flower crown, a nicho craft activity or a Day of the Dead decoration centerpiece. We hope you enjoyed our How to make Mexican orange granita! 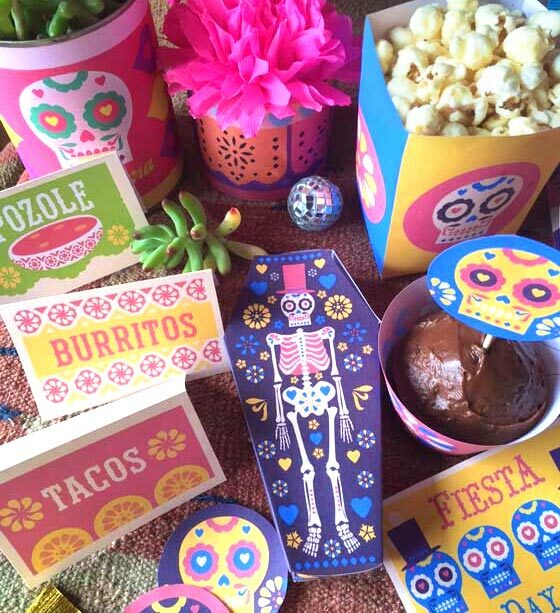 DIY Nicho activity, paper flower crown and milagro craft ideas, part of our Day of the Dead craft kit!